We continue to see the ministry of the Word produce great results. 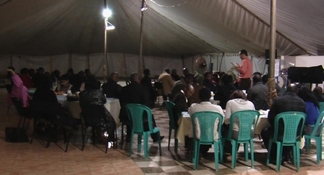 Recently, we were able to minister in a Zulu church that meets in a tent here in Durban. The desire of the church is to ground the people in the unconditional love of God and to make disciples. I was able to share some of our experiences in the Russian villages with them and that encouraged them greatly in reaching out to the lost in their areas. The Lord geared the message towards encouraging the people to believe the Gospel and to step out and bring salvation and healing to the lost. I even used my children as an example of how even kids can obey Jesus’ command and see results. At the end of the message, I had the people who were sick in various capacities to stand up. Then I had the other people act upon the Word that was taught by praying for those that were standing. There were many testimonies of people being healed! After the service, we prayed for people if they still needed prayer. Lisa prayed for a lady who had tumors in her reproductive area and couldn’t have any physical relationship with her husband. We found out later, that the lady was healed of her tumors. An interesting thing is that there were even people who asked our girls to pray for them and they saw results. As a result of that meeting, the church invited us back the next Saturday evening to minister in their couple’s dinner. We found out at that dinner that the lady was healed of the tumors. It was a great time ministering to those precious couples. The pastor would like us to do further training with the people in his church as they have been conducting different ministry outreaches to the lost. He and his wife believe that the type of training that we are able to offer would be beneficial in helping to see the Gospel make a greater impact. We would appreciate your prayers for this potential endeavor as it is in the thought stage. I am writing from Cosmo City and my name is Terence Mutseriwa. the message on grace changed my life completely. stopped condemning myself and I am understanding how good God is. offers in one week. Glory be to God!!! I thank God for your ministry and the Grace of God in your life. We would like to inform you of some good news. We received our new three-year visas for South Africa. It seemed to us, that it was taking a long time for our visas to be processed. Finally, when we went to pick up our visas, I overheard a man explaining his story to the appropriate personnel at the Residency Office. He had been waiting for over a year for his wife’s visa to be processed. None of his inquiries throughout that year produced any answers or responses. He ended up having to submit everything all over again. I think the Lord had me hear that story so that we never take God’s favor for granted. Praise God for His favor! 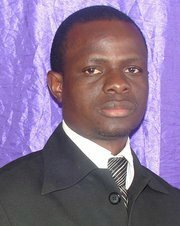 We have received invitations from pastors in different nations in Africa. They want us to come and help them train their pastors and people in the Word of God. We don’t know yet everything that we will be able to do, but we appreciate your prayers and your support. We don’t take it for granted.